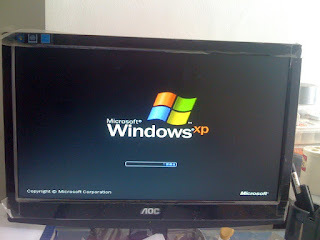 Installation of Windows Experience(Xp) is one of our task in using our computer. Windows xp is derived from the word windows experience.Its a 5th generation operating system of the Microsoft.The leading operating system builder of the computer own by Bill Gates. But before to go in installing or reinstalling your Winxp just backup first your important file in your computer using the backup system of your computer. Found in the system tools of the winxp service pack 2.This activity is a total deletion of your file because this is a reformatting activity happen in your one of the partition of your hard drive.The drive c:, the station of the operating system use in your computer.And be sure to find or backup also the hardware drivers of your Motherboards(MOBO) and other hardware's of your computer.So that you will completed the reinstallation of your operating system.And so on and so fort you will use immediately your computer after installation. Ok, what are the needs in installing Windows xp? Must be your computer CPU is clean well or maintain well before the installation procedure.Because it will probably cause hang up during and after installation because of the dust build up. Your CPU or system unit must have a DVD/CD drives connected in you CPU. In bios setup menu, check the main menu or the advance menu if your HDD is detected and your DVD/CD rom drives.If one of this two drives are absent you cannot install your operating system.Just check again your connection inside the CPU if happen. Open the boot menu or advance BIOS setup, then first boot the CD/DVD rom drive.And put your installation CD in the CD?DVD rom tray. And Save your BIOS setup and select yes by pressing enter key. Then your computer will reboot to POST(Power On Self-Test) and press spacebar to bootstrap your startup in your installation cd. And you will see the screen blue and wait until the loading and initialization of the installation files will finished. Once the loading and installation of files will finished. You will prompted to select but all you have to do is to press enter key. A license agreement will appear on screen just press F8 to accept it. Then you will bring to the partition information and just select partition 1 as the drive c: to delete the partition.Just follow the screen to delete the partition, ex press D to delete and press L to continue.Do not delete the drive D: this is because it maybe content the important files or backup of your computer. Then create you a new partition just follow and select to create the new partition, ex: press c to create a new partition.Just enter a size of partition to create then press enter key. After creating the new partition just select the new partition and press enter key to format the new partition. A progressive indicator will display in your screen, just wait until 100 percent. Your computer will reboot after copying.Just wait for the setup will finish and a windows will after,just follow the screen. Once you ask to enter the computer information just type it in the bar. And once the product key ask just type also in the bar provided.And just always follow the screen installation to continue setup your computer. Once the installation is successfully finished install first your virus scanner to avoid the virus to penetrate again.Be sure also to update it first before inserting any USB flash drive or any installation of files that has a crack. Be sure to check the HDD with the important files, it might be lost during to create a partition. Do not delete the partition D: it may content an important files. Be sure to backup important files before to proceed the installation. Be sure that the HDD is detected in the BIOS system.